The right angled thread adaptor is designed for use on the Interspiro D/V supply hoses and used where hose configurations are required to be tight to the body, or where pressure reducers and cylinders are configured so that the valve group is behind the shoulder. 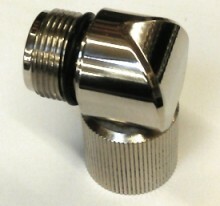 The thread connections are M16 fine; male to female and the adpator is made from brass 121, nickel plated. The adaptor meets the relevant requirments of EN250 and is the only such fitting approved for use under the UK JTM scheme. Click the button below to add the Hose adaptor with right-angle connection for Divator/Spiromatic BA to your wish list.